The Bourse has something for everyone this Valentine’s Day. Whether you are looking for the ultimate date night experience on February 14th or celebrating Singles Awareness Day and seeking closure, our vendors have you covered. Start your date night at Bronze Table and indulge in their Valentine’s Specialty dish featuring a roasted beet and goat cheese ravioli with gorgonzola cream. After your meal, pull up a seat in front of the chocolate waterfall at Chocodiem and treat yourselves to a wine and truffle flight for dessert. Don’t leave empty handed. Chocodiem and Bonatsos Flowers have teamed up to offer a gift package that your date is sure to love. Choose between two options: The Standard package which includes a 6-piece box of chocolate truffles and a half dozen rose bouquet for $45. 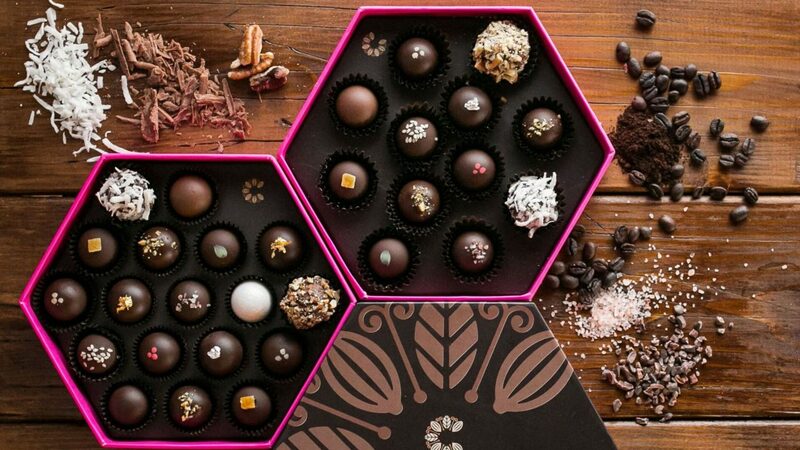 The Premium package includes a 12-piece box of chocolate truffles and a dozen roses wrapped in a bow for $85. Looking for something a little less romantic this year? Get closure this Valentine’s Day by shredding a photo of your ex. That’s right, Bluebird Distilling will have a shredder on-site. Shred her or his photo and you will receive a complimentary Clover Club cocktail made with Bluebird Distilling Juniperus Gin, lemon juice, egg white, and raspberry syrup. For the black-hearted and black beer enthusiasts, TAPS Fill Station will be serving up Schwarzbier, aka black beer, all night – $5 for 12 oz / $12 for 33 oz.